Ask RP Photonics for advice on how to retrieve information on dispersion from Kelly sidebands, how to model their parameters, how to suppress them, etc. In a soliton mode-locked laser, a soliton pulse is circulating in the laser resonator. If the effects of chromatic dispersion and nonlinearities per resonator round trip are weak, the pulse essentially experiences their average values plus some weak periodic disturbance due to the discrete nature of dispersion and nonlinearity. Additional disturbances can result from the periodically occurring losses and amplification in the laser resonator. The mentioned periodically occurring disturbances couple the soliton to a copropagating dispersive wave. This often does not have strong effects, since the relative phase of soliton and dispersive wave is constantly changing due to the nonlinearity which is experienced only by the soliton. However, particularly in fiber lasers a kind of resonant coupling (or quasi-phase matching) can occur, when for some optical frequencies the relative phase of soliton and dispersive wave changes by an integer multiple of 2π per resonator round trip. This results in the formation of narrow peaks superimposed on the soliton spectrum (see Figure 1). Such peaks are called Kelly sidebands. From their positions in the optical spectrum, information on the spectral profile of the chromatic dispersion of the fiber can be retrieved. 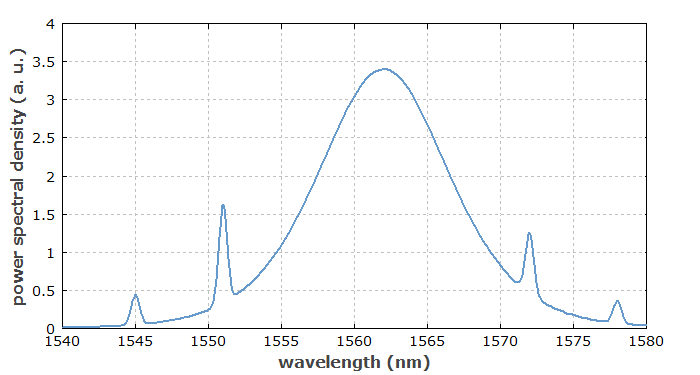 Figure 1: Optical spectrum of the output of a soliton fiber laser, exhibiting Kelly sidebands. Kelly sidebands are usually not observed in mode-locked bulk lasers, but often in soliton fiber lasers. This is because the intracavity nonlinearity and dispersion is much larger in fiber lasers (→ mode-locked fiber lasers). The nonlinear phase shift per resonator round trip in a soliton fiber laser is inversely proportional to the pulse duration. Therefore, Kelly sidebands become much more pronounced as the pulse duration is decreased e.g. by increasing the pulse energy. When the laser is driven too far into this regime, the soliton pulses become unstable. Strong Kelly sidebands thus indicate that the pulse duration is near the minimum possible value.